AutoQuad flightcontrollers can use CAN or OneWire communication to configure all ESC32´s connected on bootup. The process is very simple; you basically just create a text file on the SD-card, which contains the parameters you want to change and the controller will load them to the ESC32´s attached on the next bootup. all ESC32s attached to the AutoQuad flight controller. Must be using CAN bus connection to AQ and Quatos attitude controller. We will change the settings marked by yellow. As you can see, we have default settings with no calibration parameters loaded. 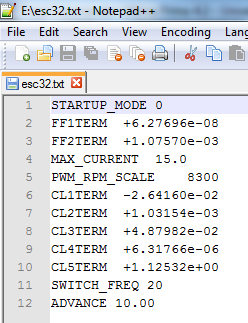 Now save the esc32.txt file and power-on the AutoQuad flightcontroller. Make sure the ESC32s are also powered on but remove the props if you are using the main battery. Insert the uSD card. Logging will start indicated by the fast flashing ready light. Press the reset button or restart the AutoQuad controller from QGC. The boot will take 1-3 seconds longer and ALL attached esc32’s will now be programmed with the settings from the esc32.txt file. Verify by attaching a FTDI interface to one of the ESC32’s and look if the settings have been changed. This page was created on 26-Aug-12 by menno. Last modified on 21-Aug-15 by kinderkram.